In 2010 the Lifelong Learning Platform and the European Youth Forum set up a stakeholders’ coalition related to adoption of a new EU programme in the field of education and youth for the period 2013-2020. As we are now 3-4 years ahead of the next generation of EU programmes. In a joint coalition, youth and education sectors will have more chances to have an advocacy impact in the negotiations. The goal is to foster concrete proposals and to get the support of the European Parliament and other institutions. The coalition should aim to make sure that “the Brussels case” is solved as a priority. In 2017, and ahead of the next Multi Financial Framework negotiations for the following year, the Coalition decided to set up a campaign to ask decision-makers for a robust increase of the Erasmus+ budget: ten times more! The #Erasmusx10 campaign is run jointly by the Lifelong Learning Platform, the European Youth Forum, and Eurodesk. 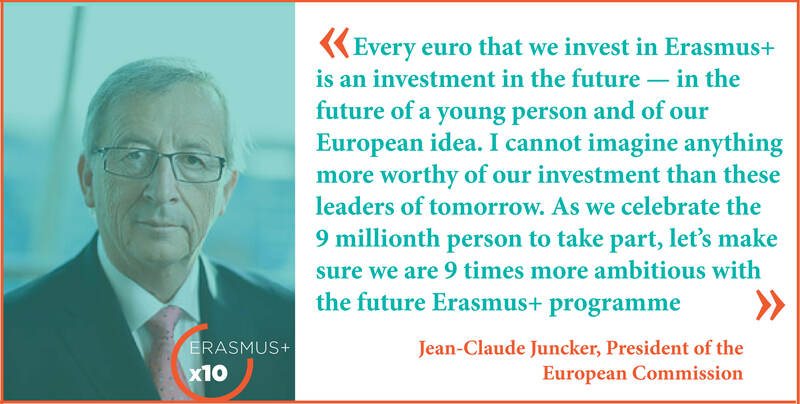 Earlier this year, President Juncker invited the institutions to be nine times more ambitious! Juncker declarations follow the political will of a consistent increase of the Erasmus+ budget expressed by several heads of State and government of some Member States such as Belgium, France, Italy. Furthermore, during the Rome Summit on the 60th anniversary of the treaty. 1st meeting of the Erasmus+ coalition: towards a stronger programme for education and youth! New Position Paper: Implementing Erasmus+ better!